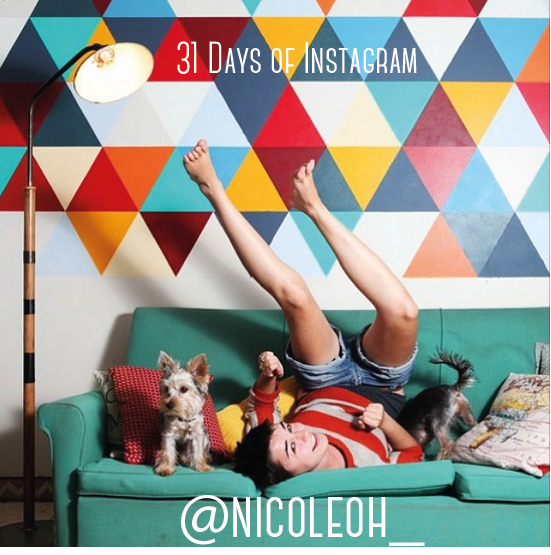 Nicole was the first person I met who had the patience to sit and teach me how to use a proper camera so once again it’s only fitting that she fills the spot of day 2 on 31 Days of Instagram. More than being an amazing photographer and videographer, Nicole is an amazing teacher. She has inspired me in ways that I’m not even sure I realise yet and I’m so glad I get to tell amazing stories with her everyday. I work at Cerebra as video content producer. I love spending time thinking about, cooking and going out for food. Watching series. I knew about Instagram though friends who had smartphones. I eventually got an iPhone at the end of last year and was most excited about the phone because I could get Instagram. Oh wow! So many amazing local instagrammers! I don’t know how to pick. Here are some: welile_n, buka_andile, southafrica, shesaidsa (you really piqued my interest and taught me a lot about the platform), roywrench, daveast, emmajanenation, garethponeats, 2summers, ciden, lovemademedoitx. There was a turning point for me, after a talk you gave on Instagram at the office, when I decided to treat it more seriously. Giving my account a focus and a look and feel (my personal style) made a difference. Make connections by attending Instawalks and exploring local Instagrammers. Use appropriate hashtags. I’ve been photographing for about 8 years and think that my style has developed in more recent years. I’m not sure what it is but I think it still has a way to go and can be different depending on the subject matter (taking portraits in a certain way versus photographing food or fashion).I really enjoy taking photos of people. I love exploring Joburg City and Soweto (so much more to see).